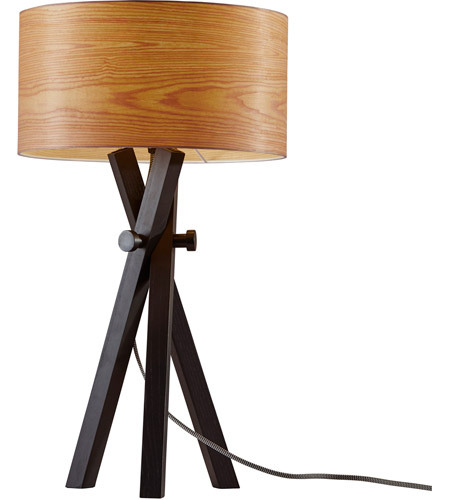 A stunning cherry wood veneer lamp shade is the eye catching feature of the Bronx Table Lamp. The drum shaped shade is highlighted with a rich wood grain texture when lit. The warmth of this softly diffused ambient light provides an interesting contrast to three dark black oak wood legs. A decorative black and white fabric covered cord hangs neatly from the socket, adding to the modern aesthetic. A 3-way rotary switch is located on the socket. The 3-way rotary socket switch will only work with a 3-way light bulb, otherwise this lamp will function with simple on/off switch at its highest setting.